FutsalRVA : : Central Virginia’s Futsal League for youth, academy, and adults. Our Mission is to promote the game of Futsal as a player development initiative. 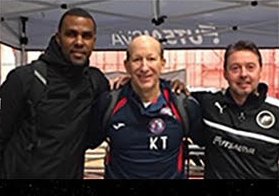 Futsal RVA specializes in the promotion and education of the sport of Futsal through training programs and the organization of leagues and tournaments at a time when the game is starting to gain recognition as important to the development of the soccer player in the United States. FutsalRVA recognizes that the introduction of a Futsal program can positively impact the key areas of player development in all levels and ages. FutsalRVA is adding value to our Academy programs in many ways. . . Exclusive access to live or post-game video for no additional cost! U-Turn is the first indoor facility in the entire country with this technology. We're super excited to provide this for our coaches, athletes and parents! UNITED STATES YOUTH FUTSAL is the largest national futsal organization affiliated with US Soccer. With over 70 leagues throughout the country, 7 Regional tournaments and a National Championship, it is the fastest growing futsal organization in the U.S. US SOCCER Is the governing body of all soccer in the United States. Its mission is to make soccer, in all its forms, a preeminent sport in the United States and to continue the development of soccer at all recreational and competitive levels. USSSA is a non-profit organization whose mission is to develop and expand the game of soccer in the United States. USSSA has been an affiliate of US Soccer since July, 2001. USSSA registers, sanction and provides insurance for leagues, clubs, academies and players. RICHMOND UNITED was established by the Richmond Kickers and Richmond Strikers when the two clubs united their respective U.S. Soccer Development Academy and Girls programs to introduce a collaborative program designed to serve the most talented players in the region.